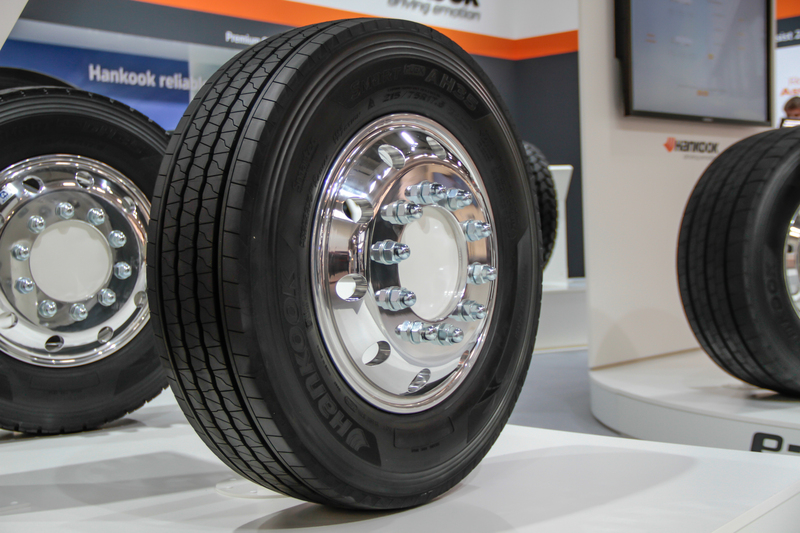 Han-Jun Kim, President of Hankook Tire Europe and Péter Szijjártó, Minister of Foreign Affairs and Trade of Hungary. 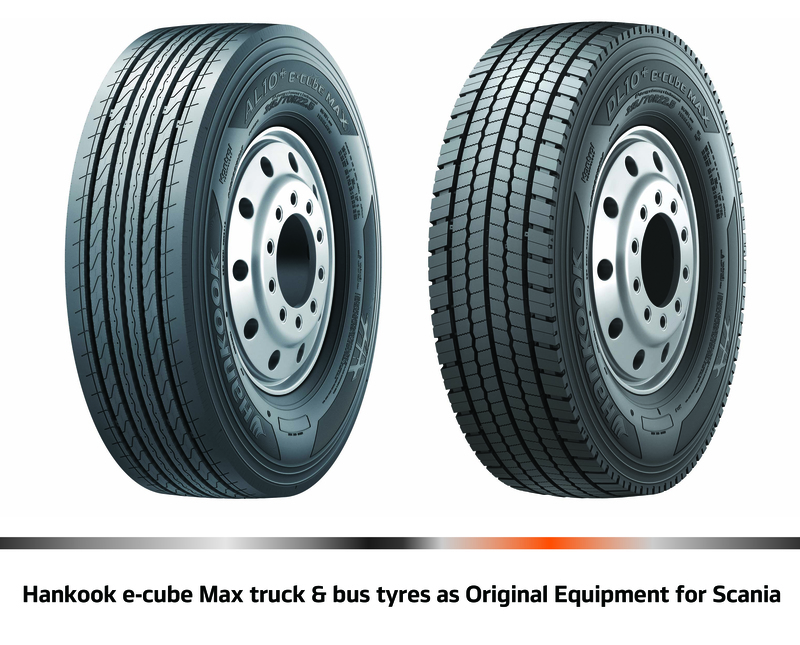 The e-cube MAX AL10+ (all position long haul) utilises linear grooves with waved walls to prevent uneven wear, enhancing durability and providing improved long-term fuel efficiency. 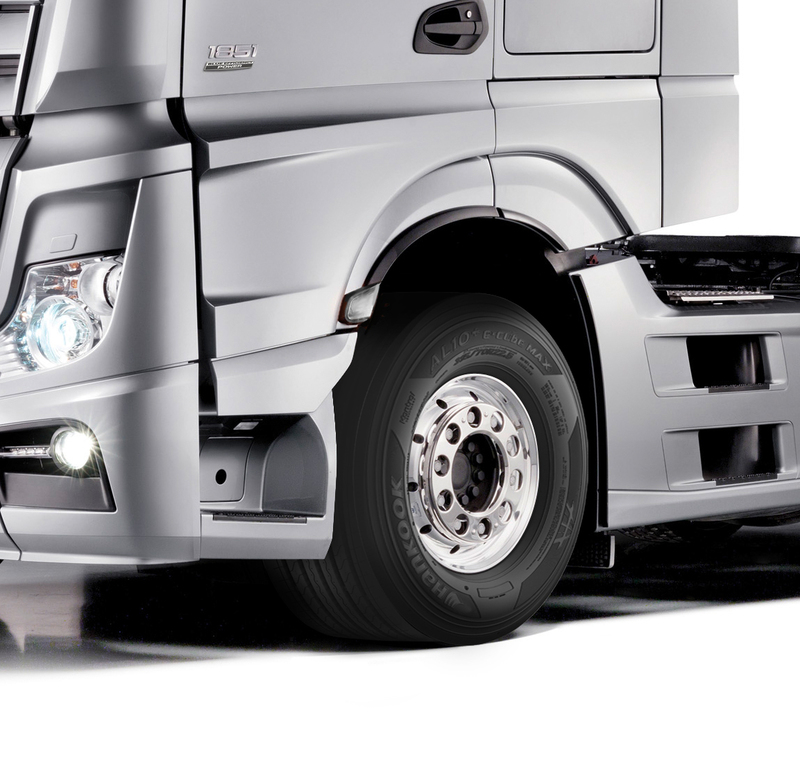 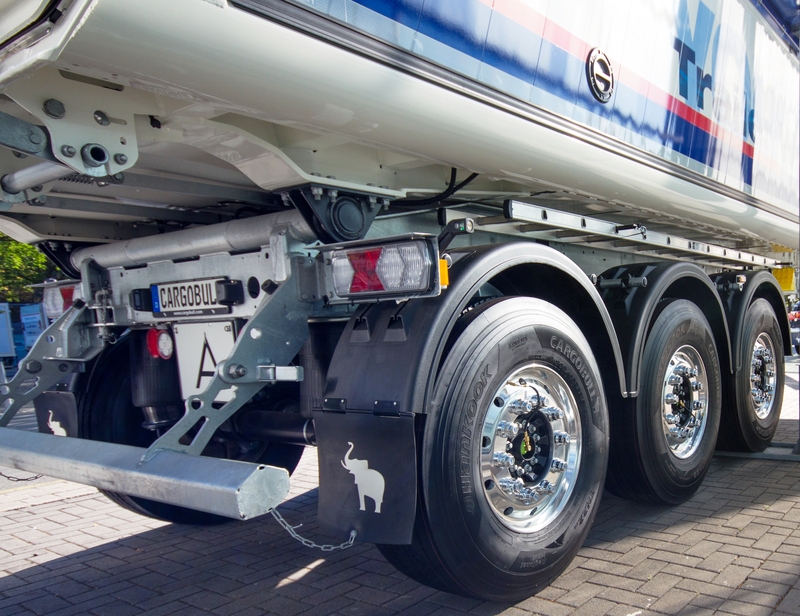 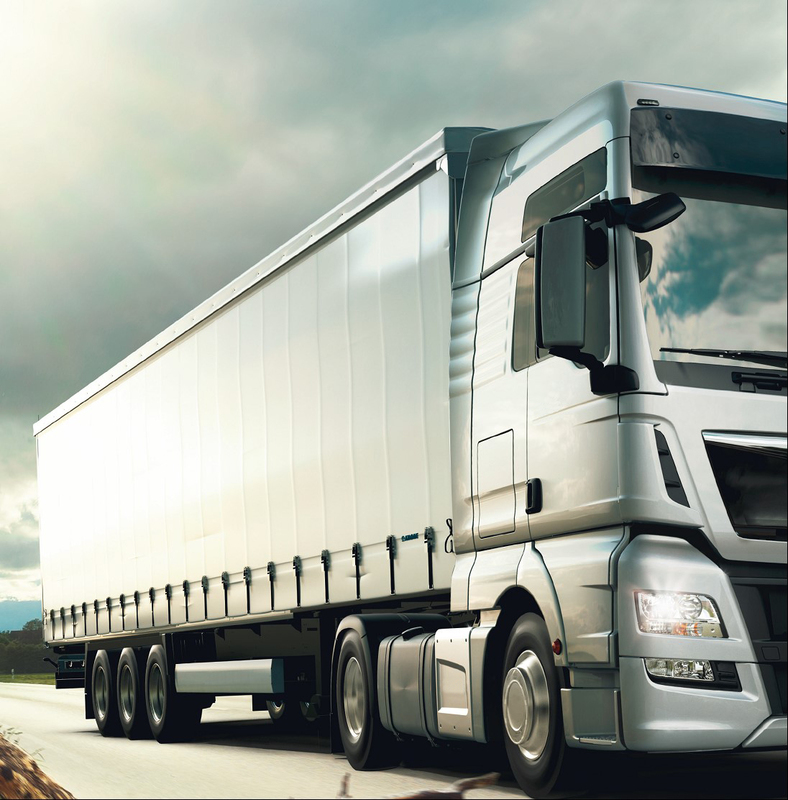 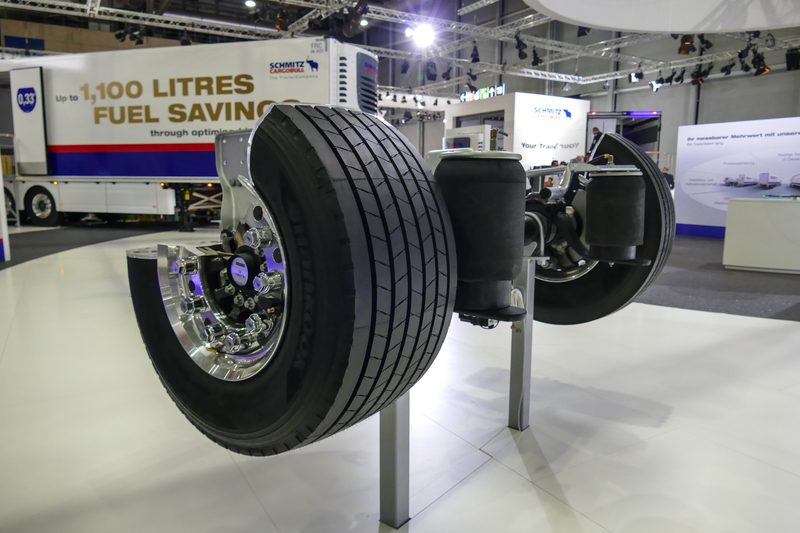 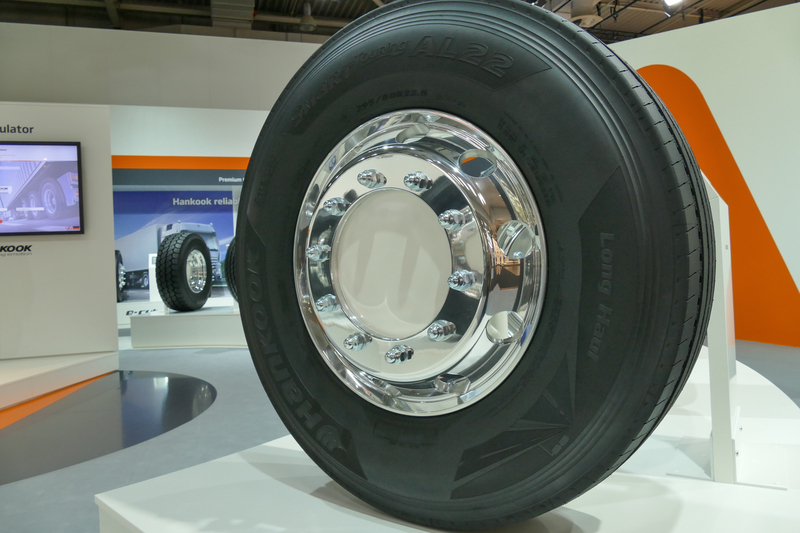 The improved tread compound and high load index of the AL10+ increases fuel efficiency whilst simultaneously increasing load capacity. 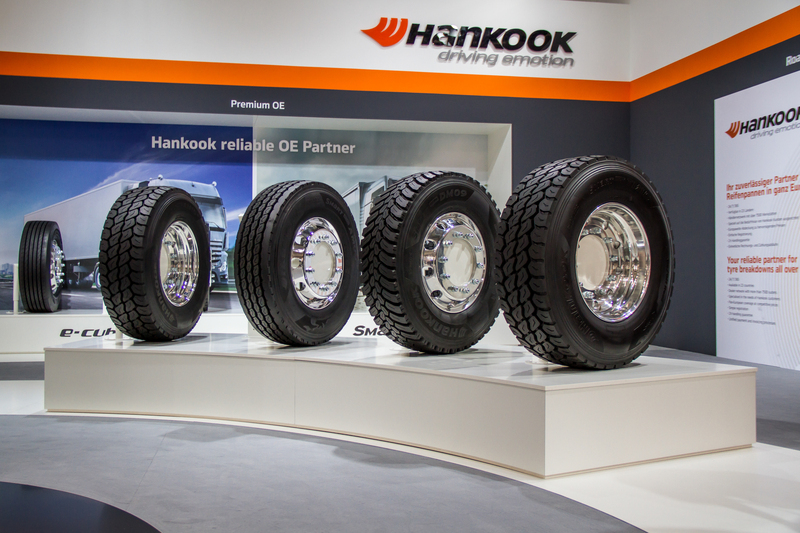 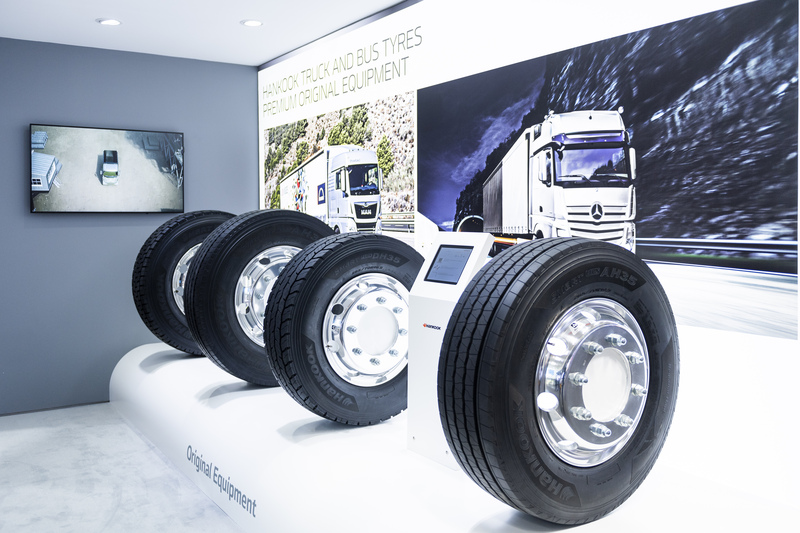 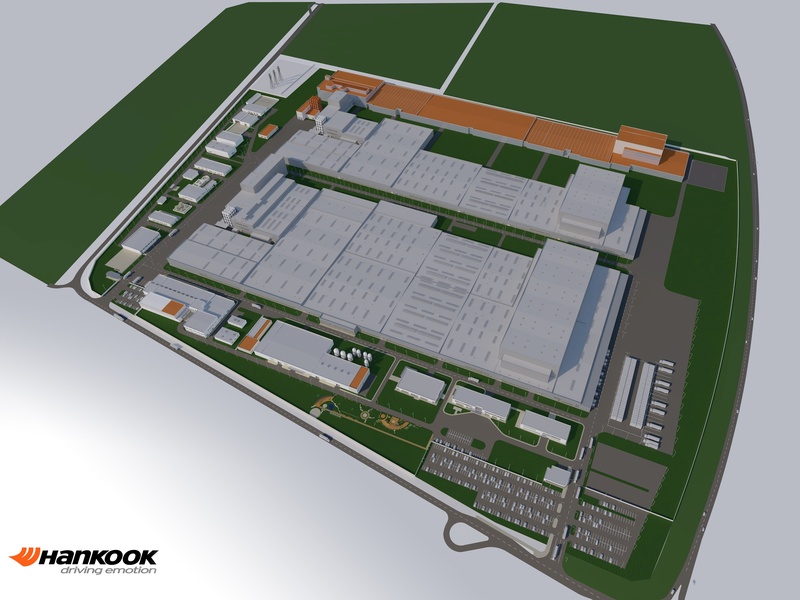 In 2014, Hankook Tire was selected as an OE supplier for Mercedes-Benz medium duty Atego trucks and the heavy duty model range Actros. 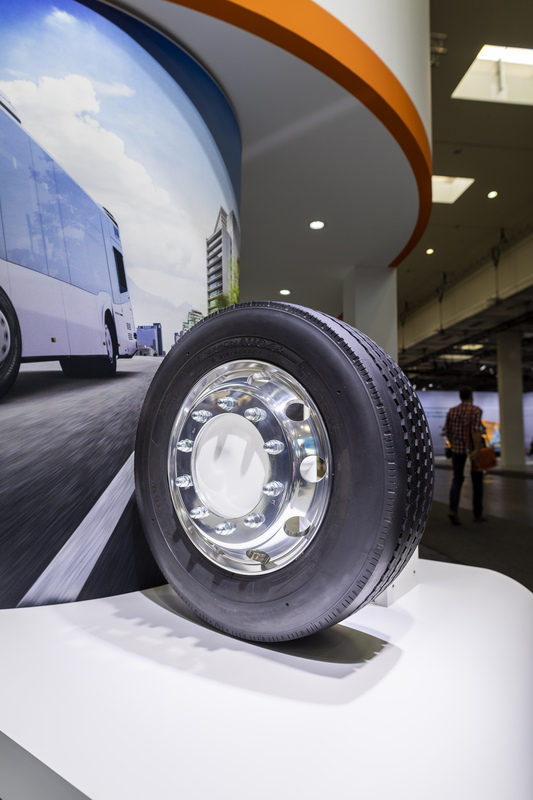 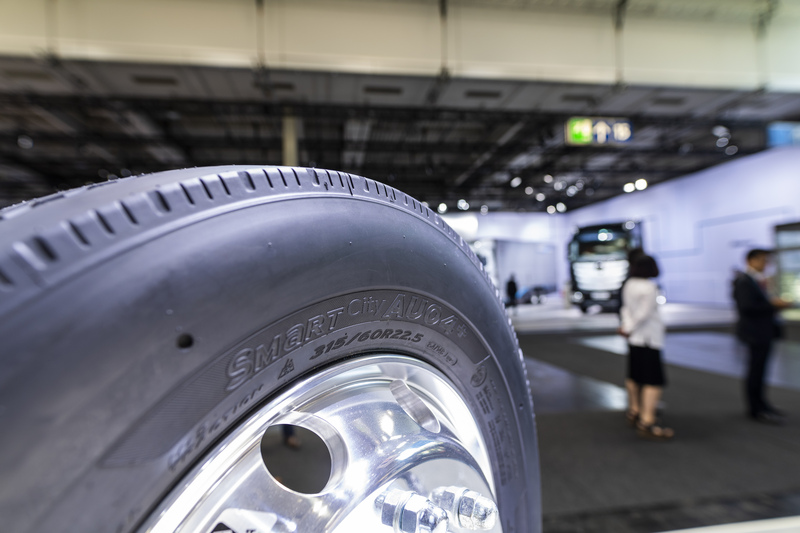 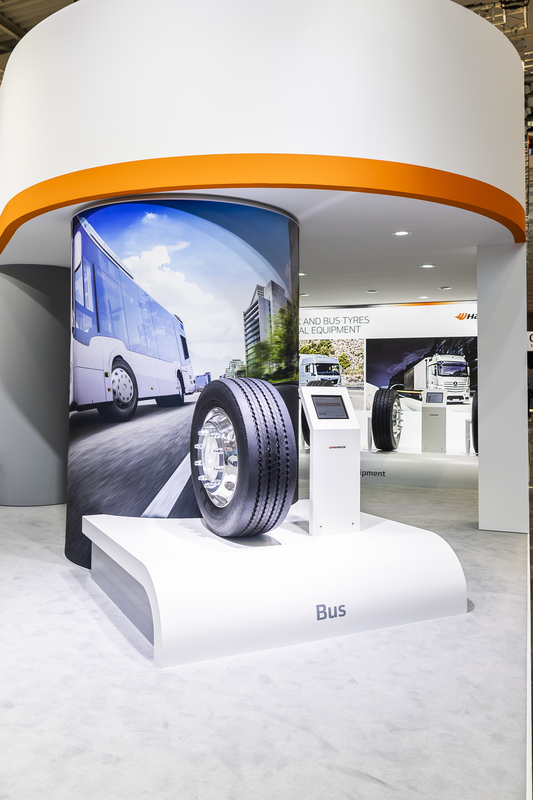 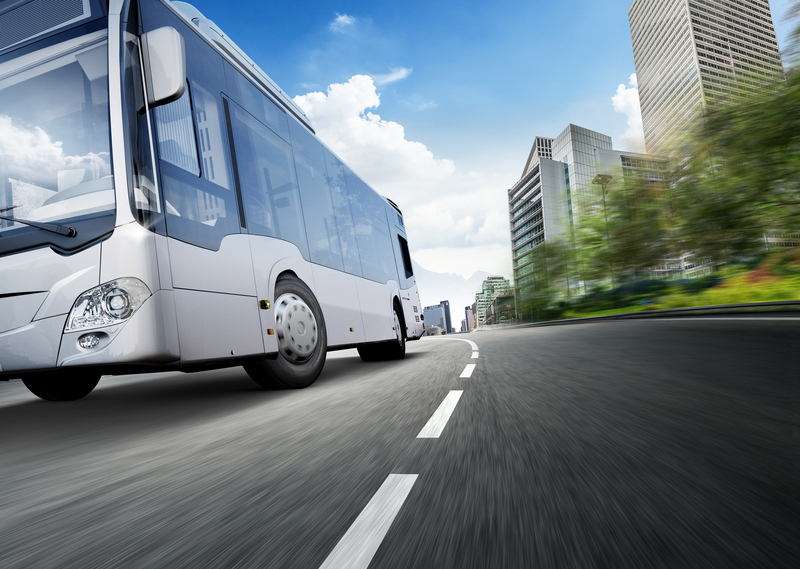 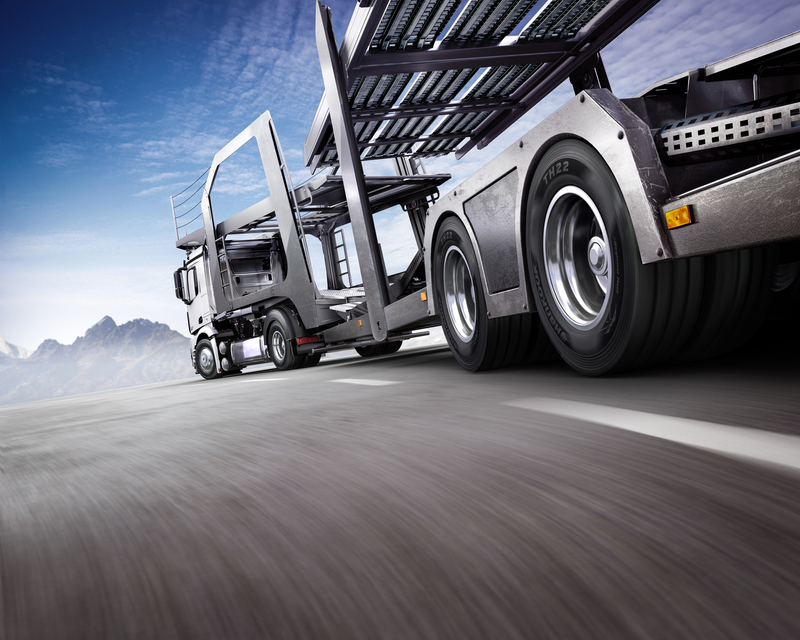 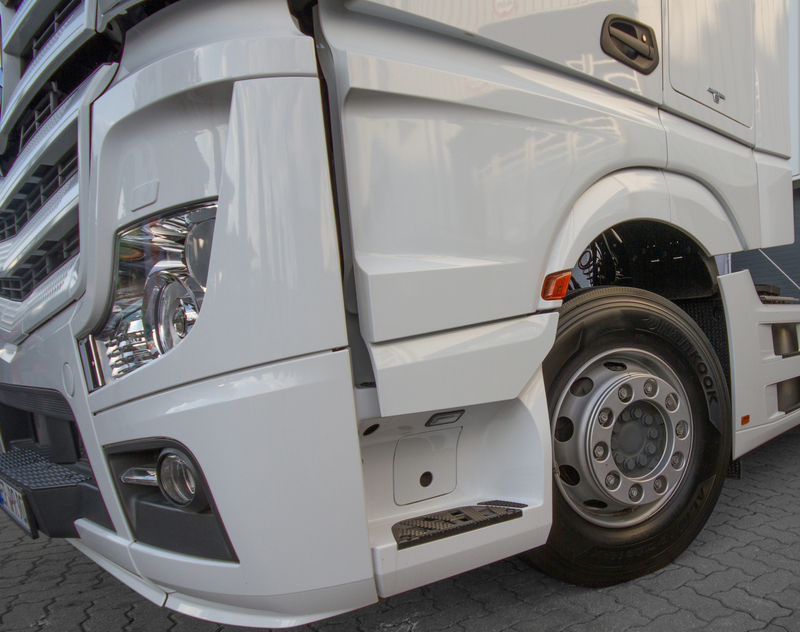 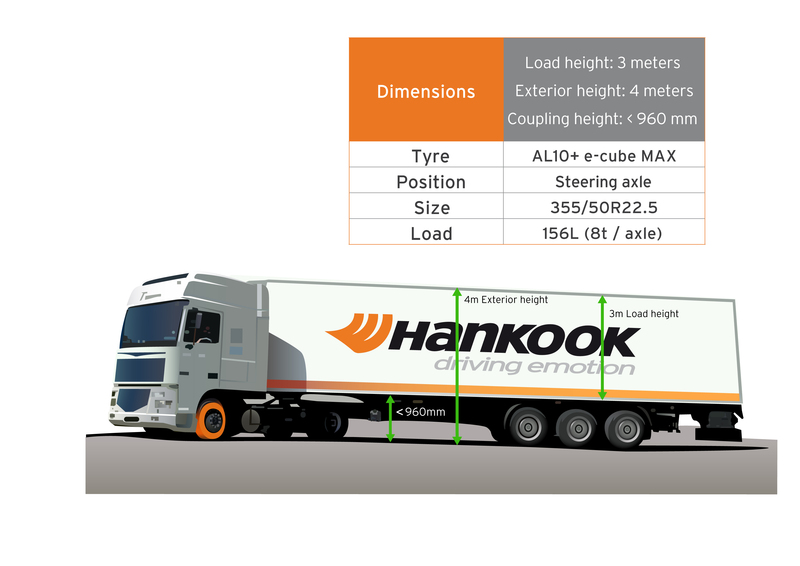 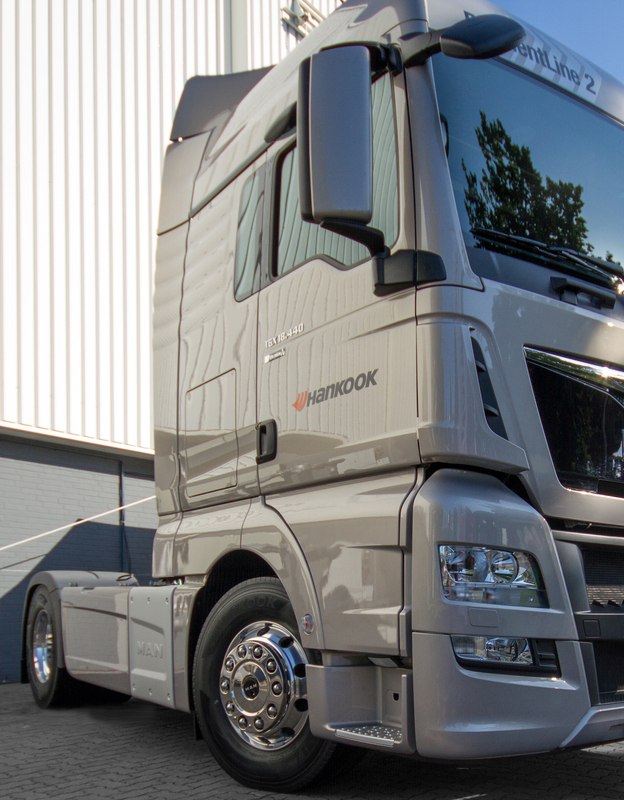 Hankook's latest original equipment line-up for Mercedes-Benz trucks includes among other the Hankook treads AL10+ e-cube MAX and DL10+ e-cube MAX, as well as the SmartFlex AH31 and SmartFlex DH31, all of which have been specially developed for the European market. 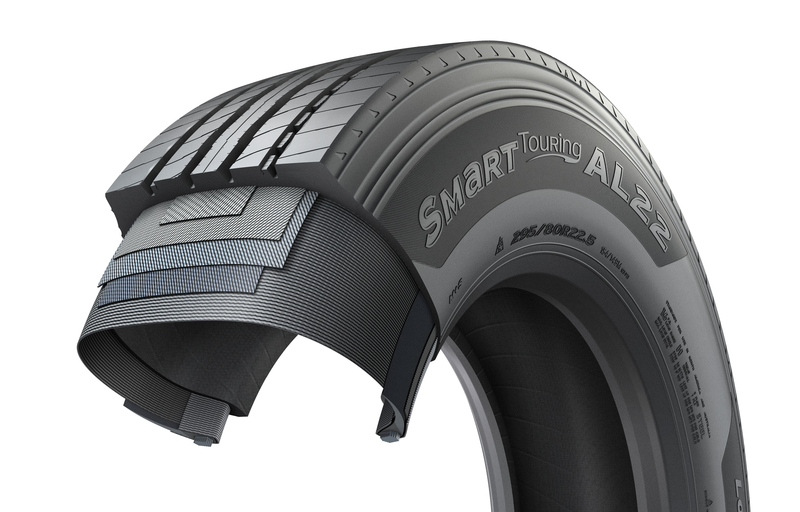 The SmartWork AM15/AM15+ has been designed especially for off-road use. 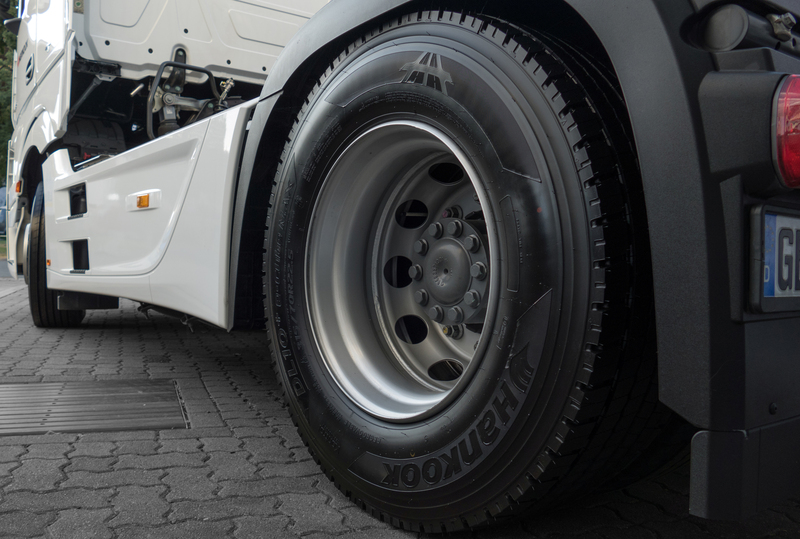 Its extra-wide tread blocks guarantee optimum traction on uneven surfaces like those typical of construction sites. 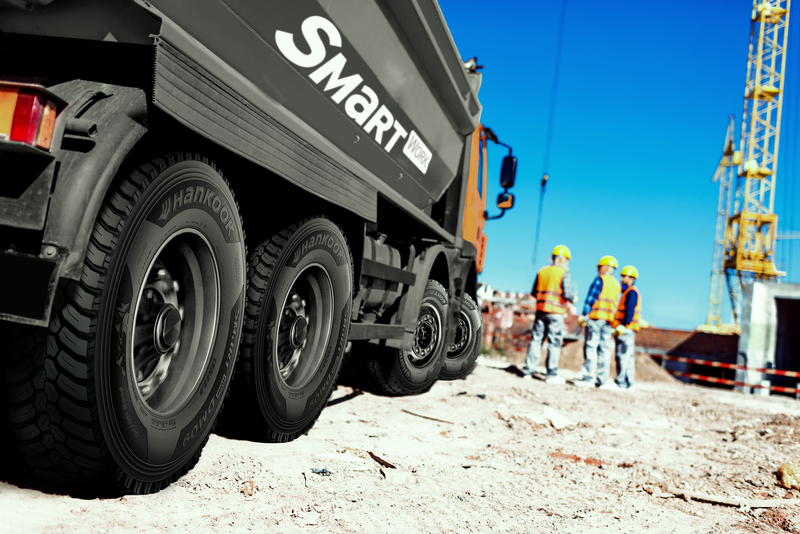 The SmartWork DM09 is available for the drive axle. 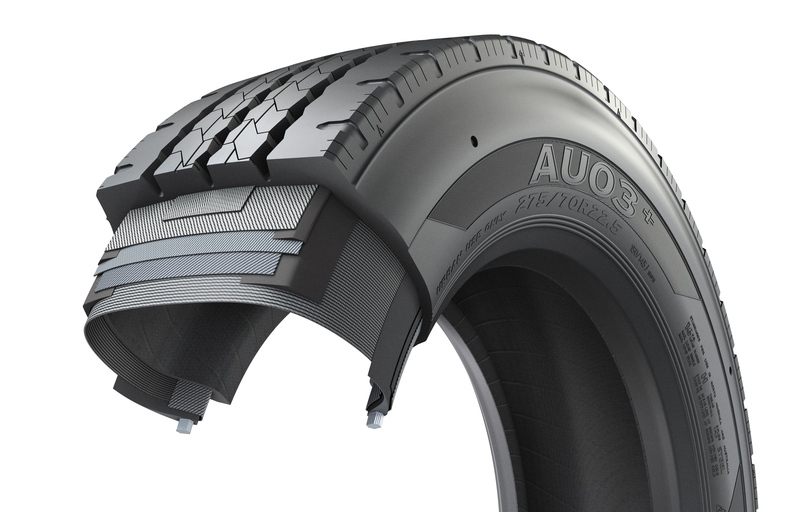 The directional tread design enables improved displacement of mud and water. 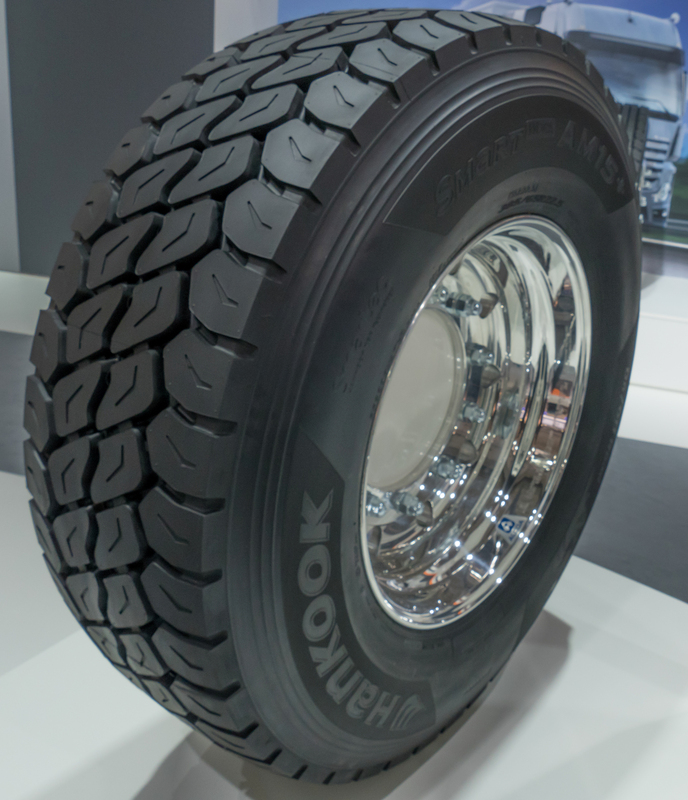 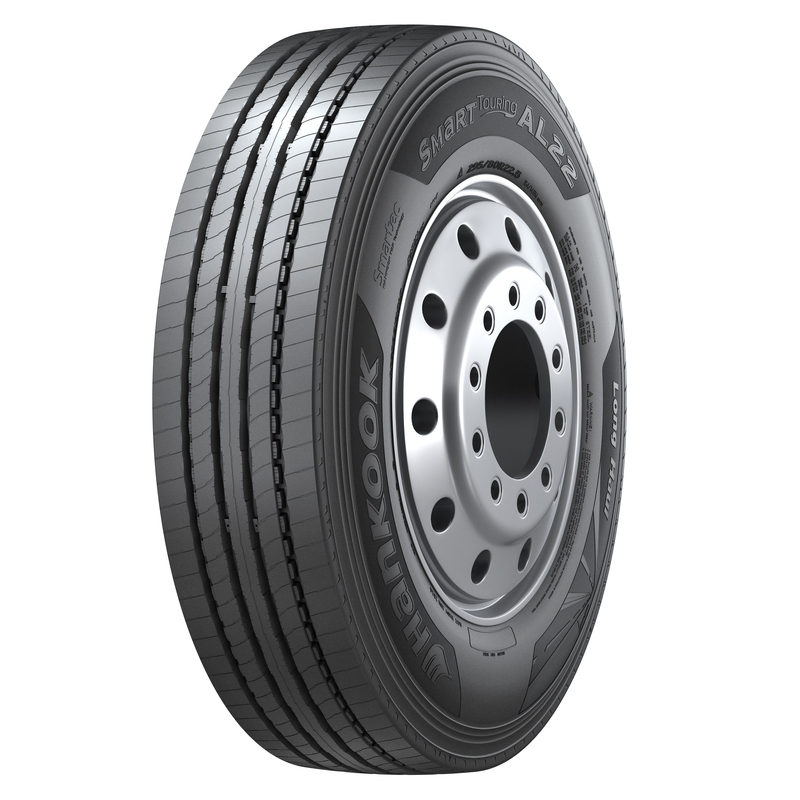 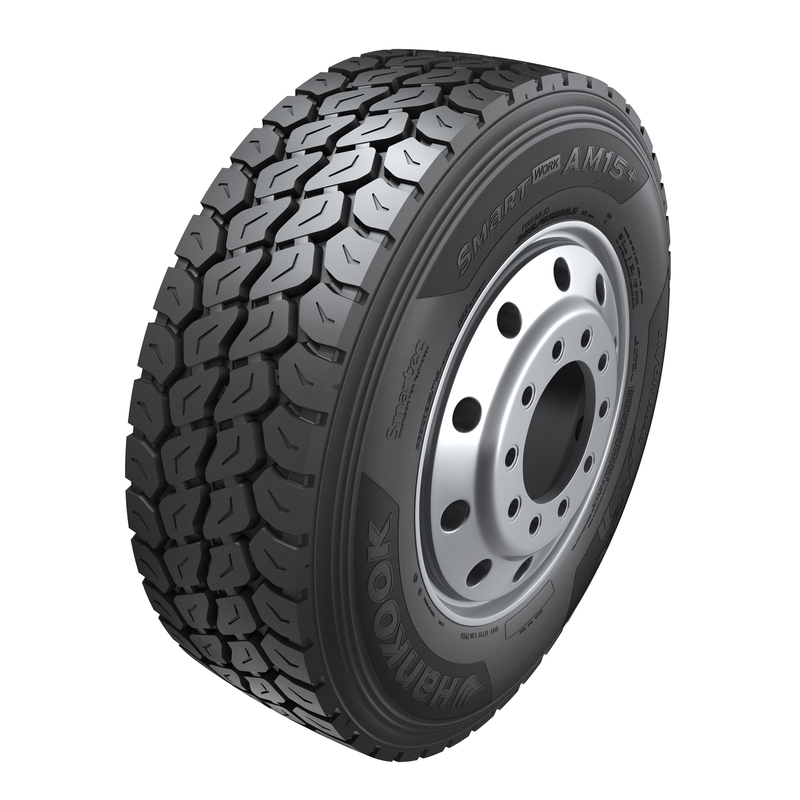 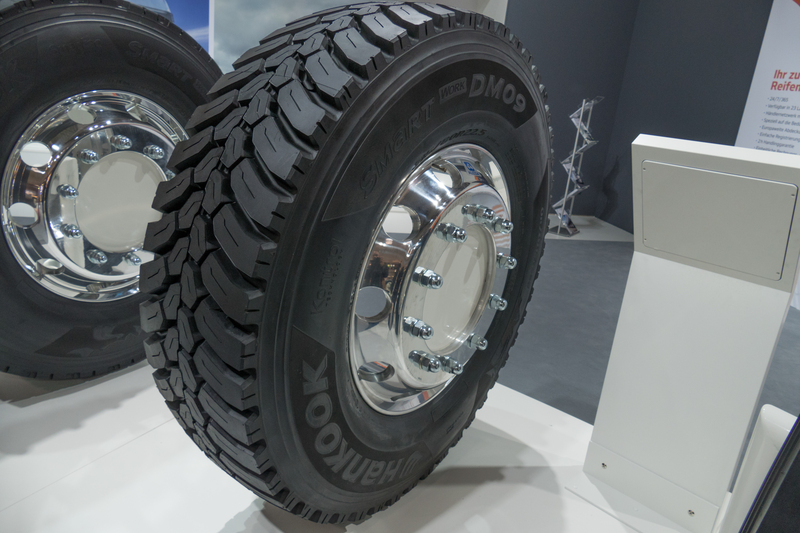 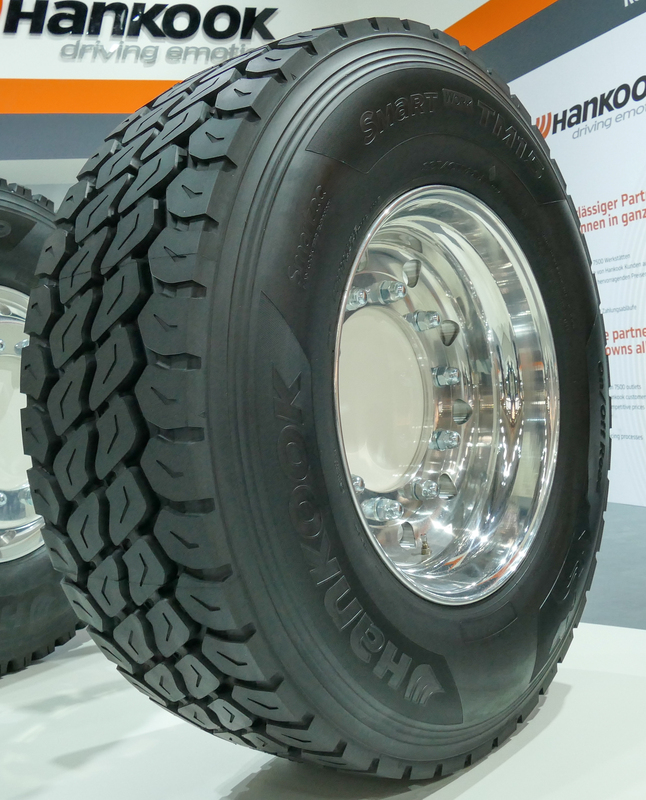 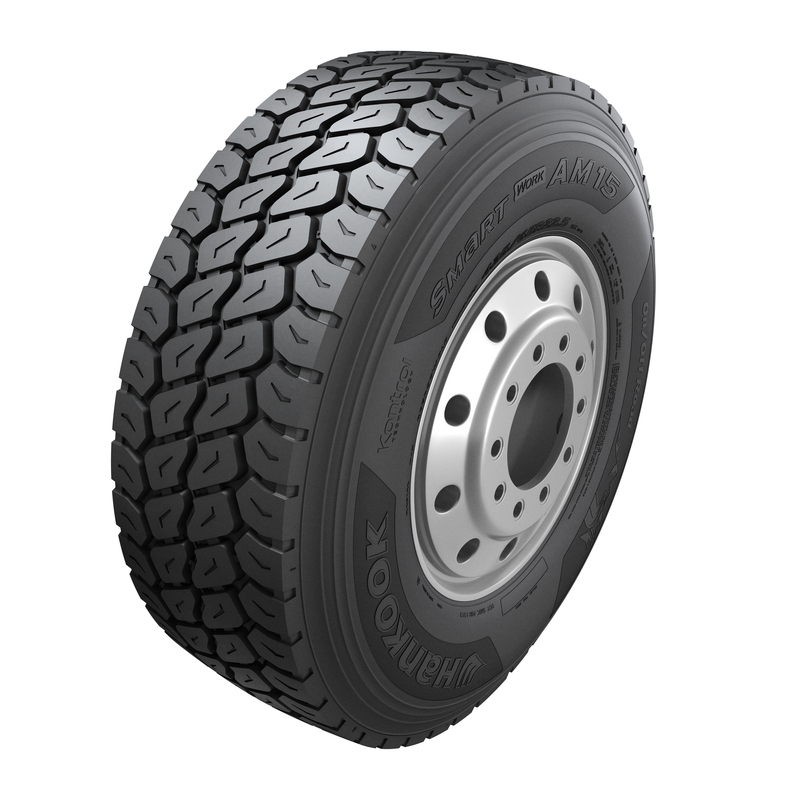 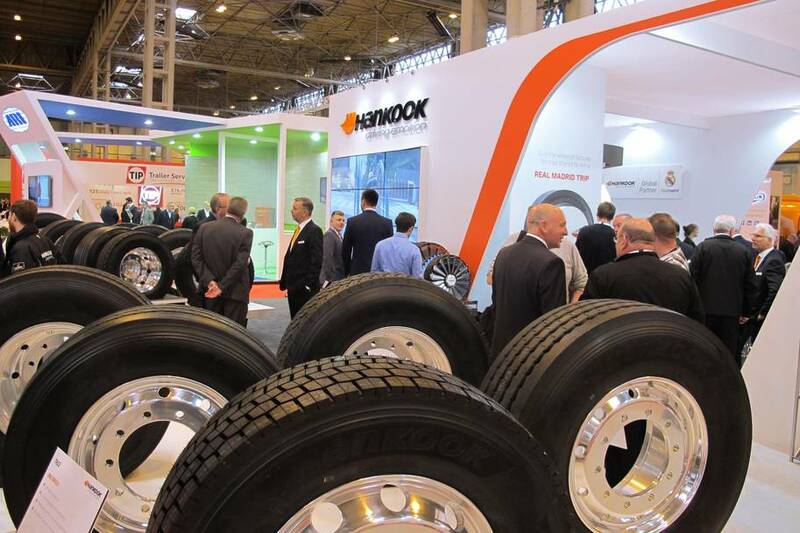 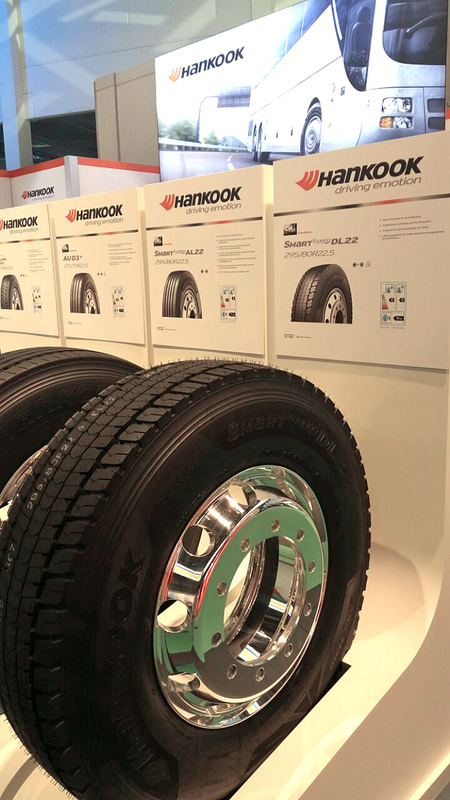 Hankook's truck range for use on construction sites, comprising of the tyres SmartWork AM09, SmartWork AM15/AM15+ for the steering axle, the SmartWork DM09 for the drive axle and the SmartWork TM15 for the trailer, was developed especially for the demanding tasks in the on- and off-road segment. 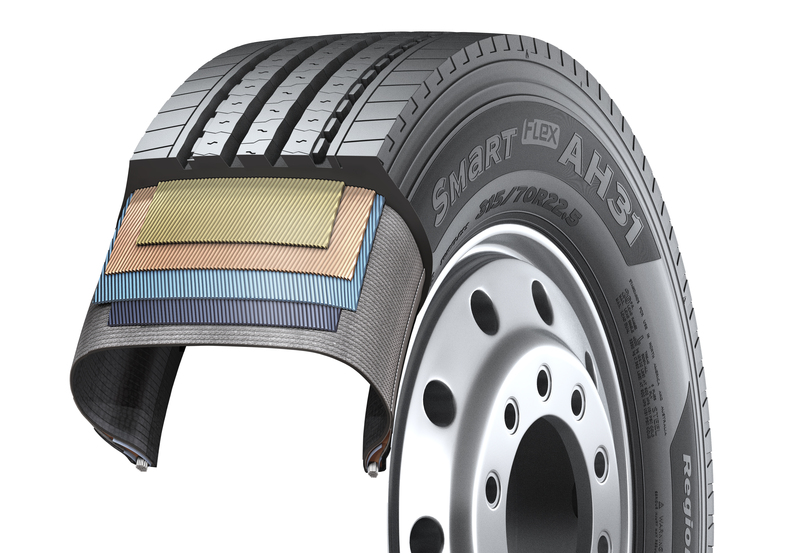 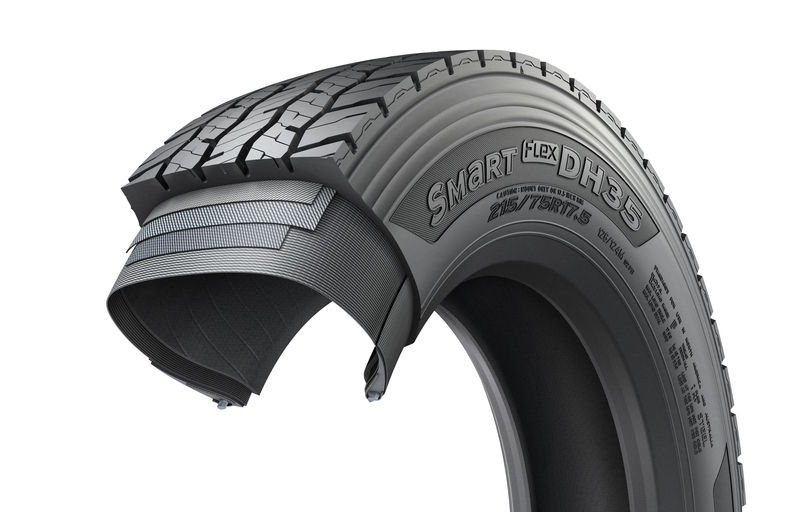 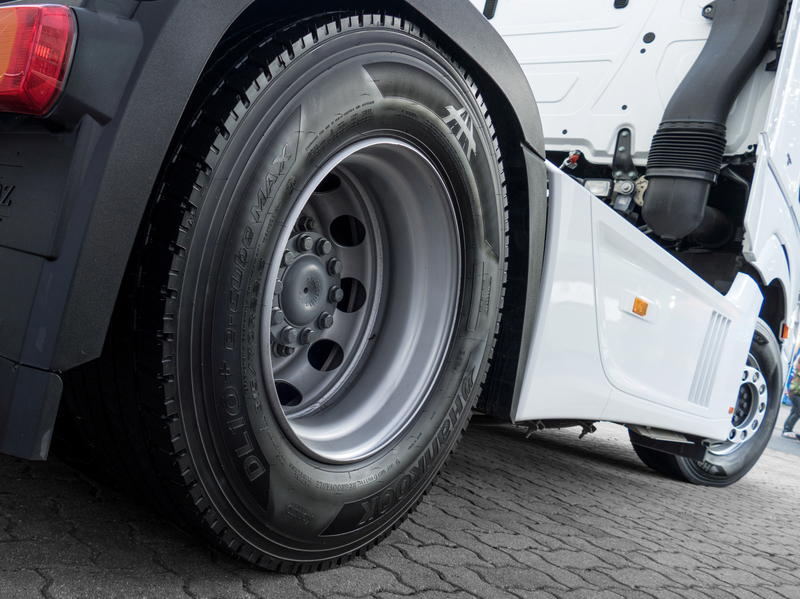 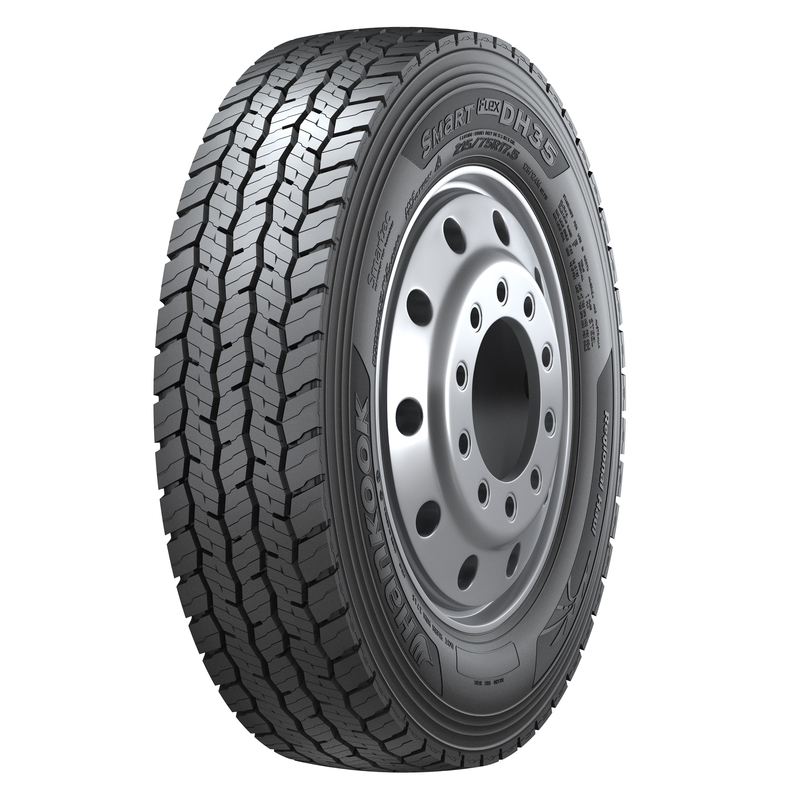 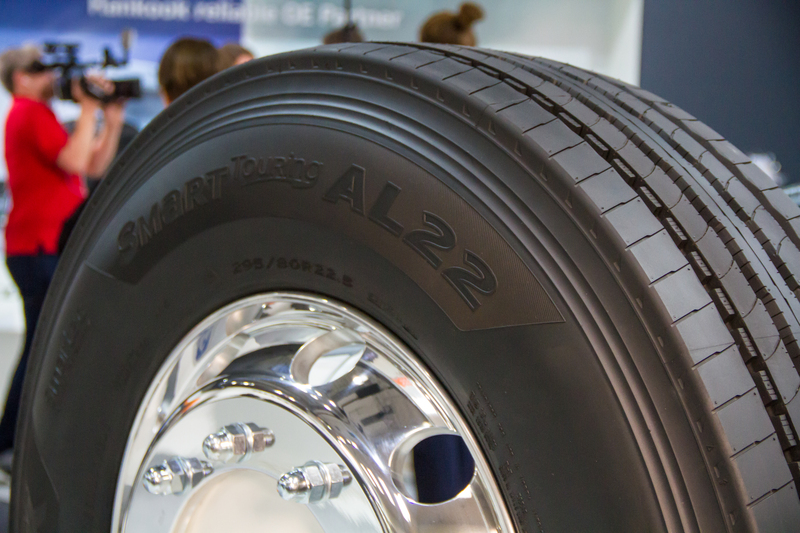 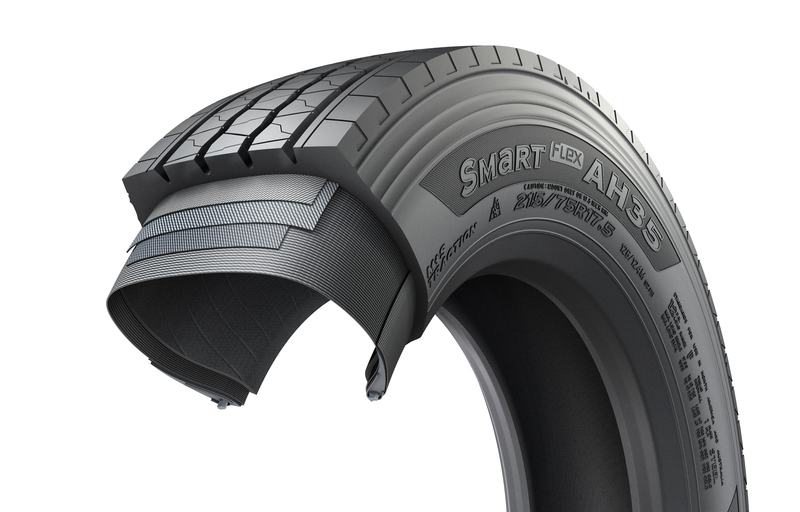 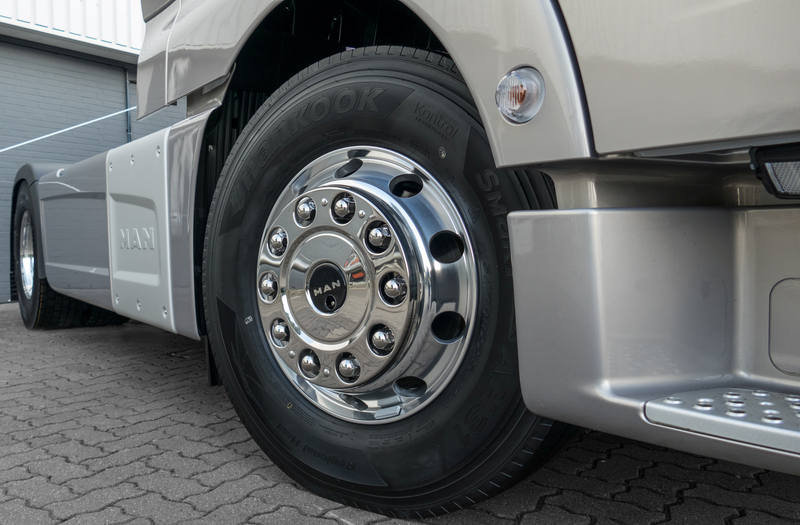 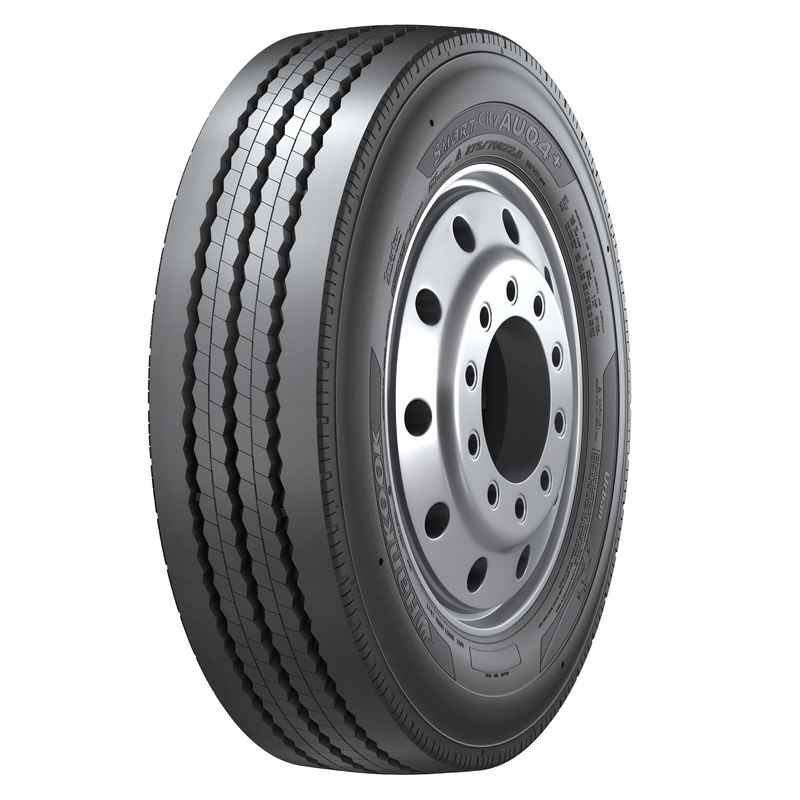 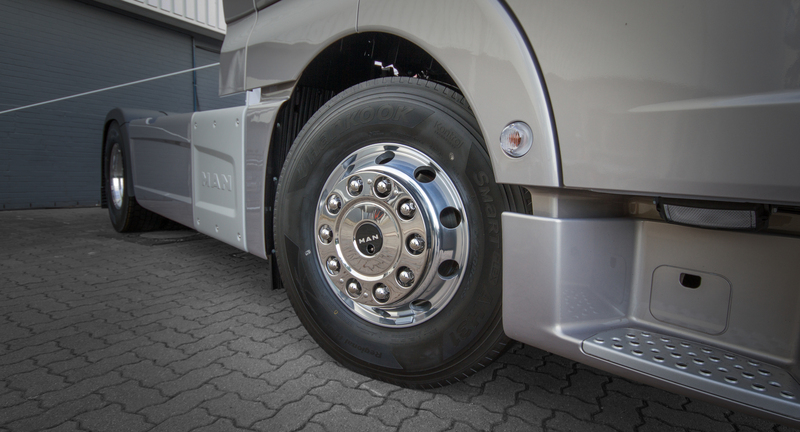 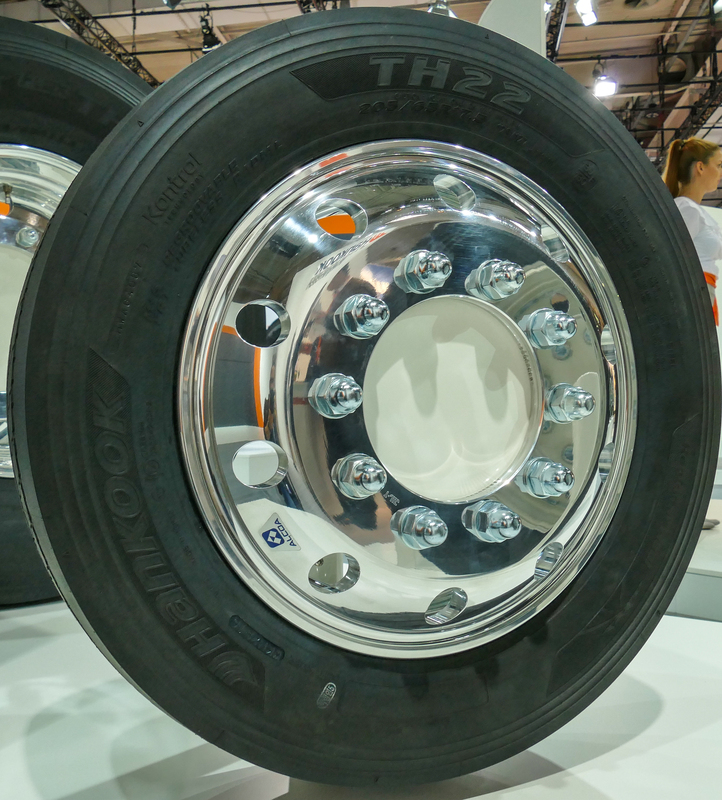 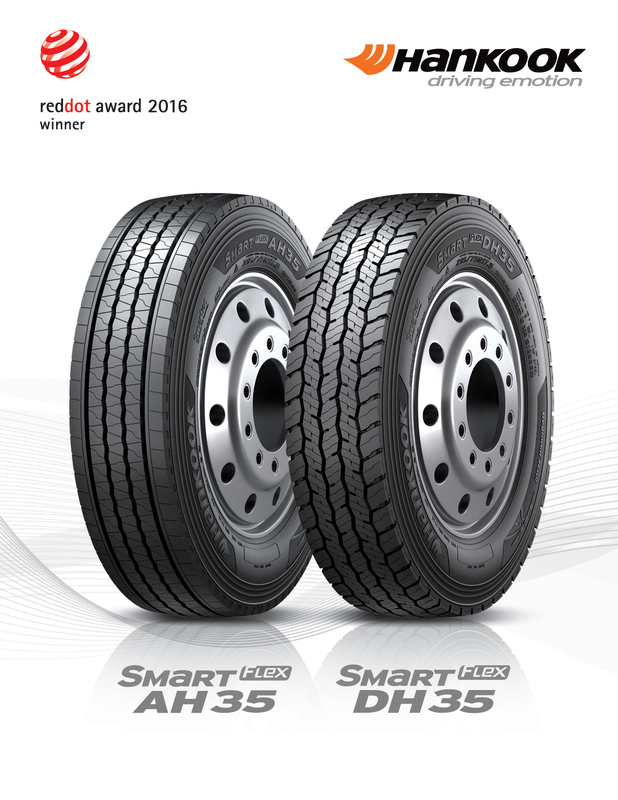 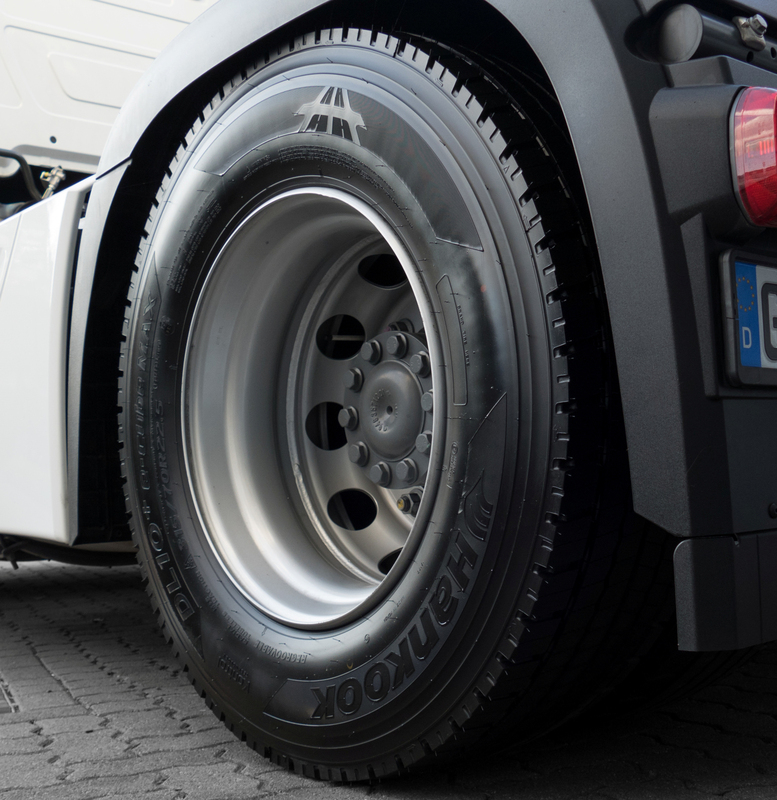 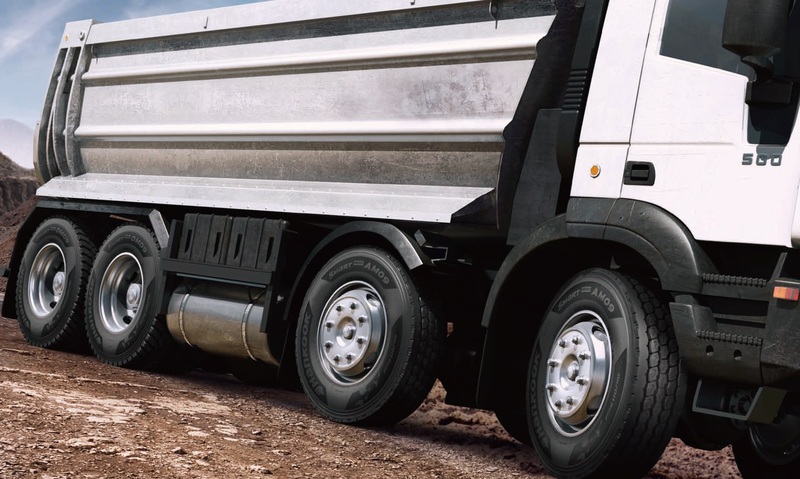 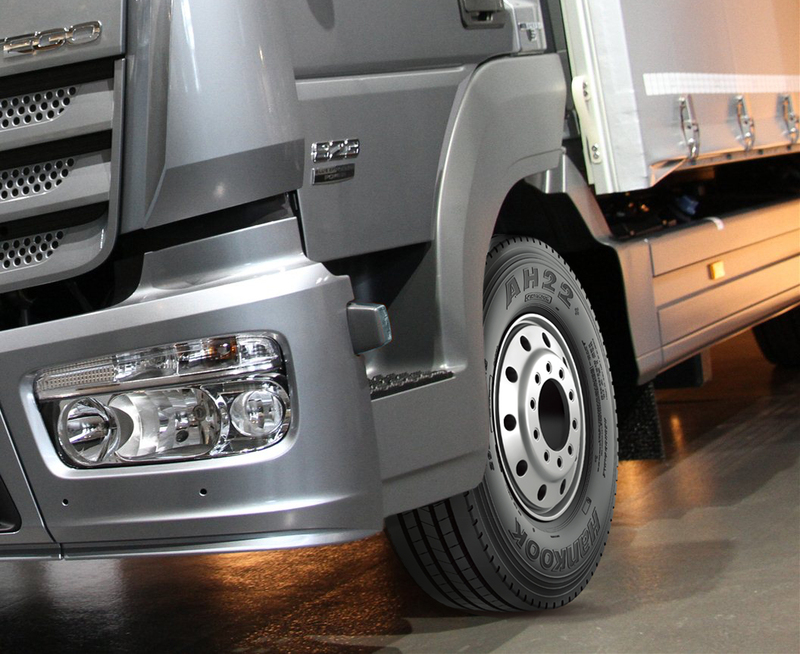 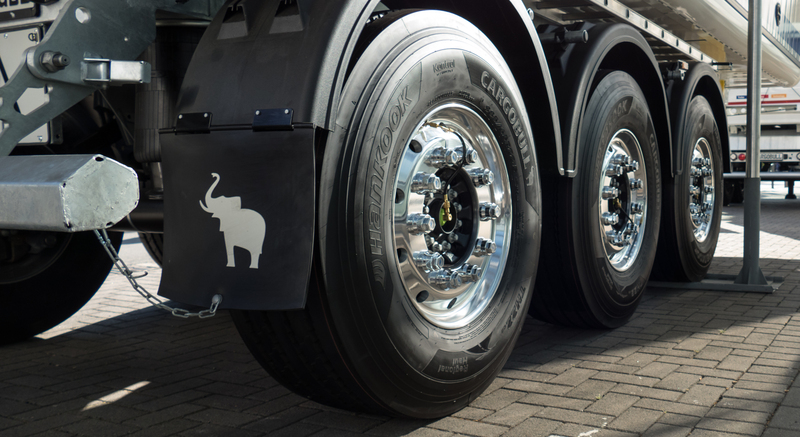 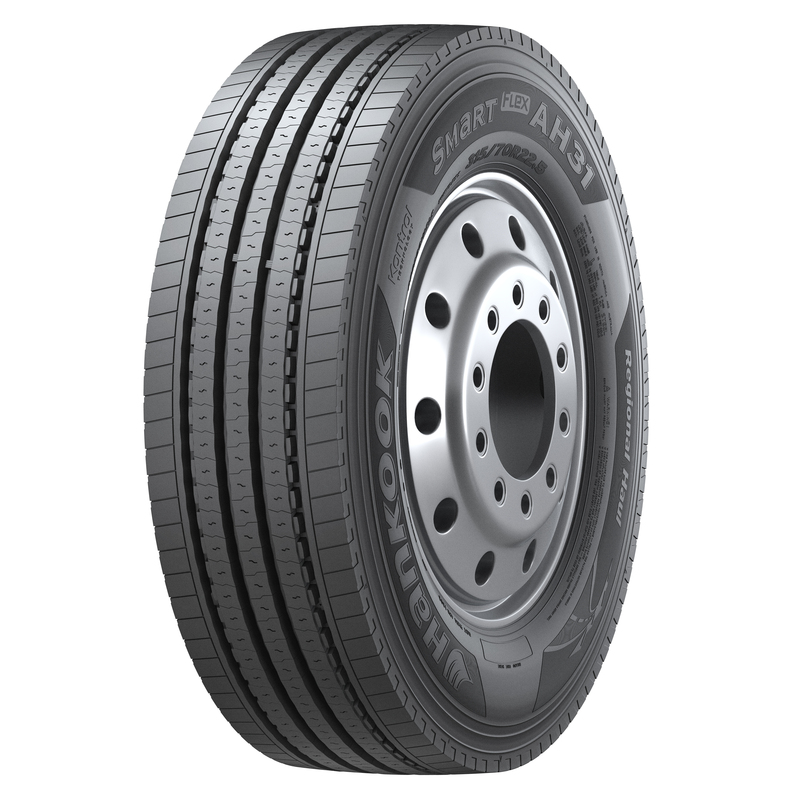 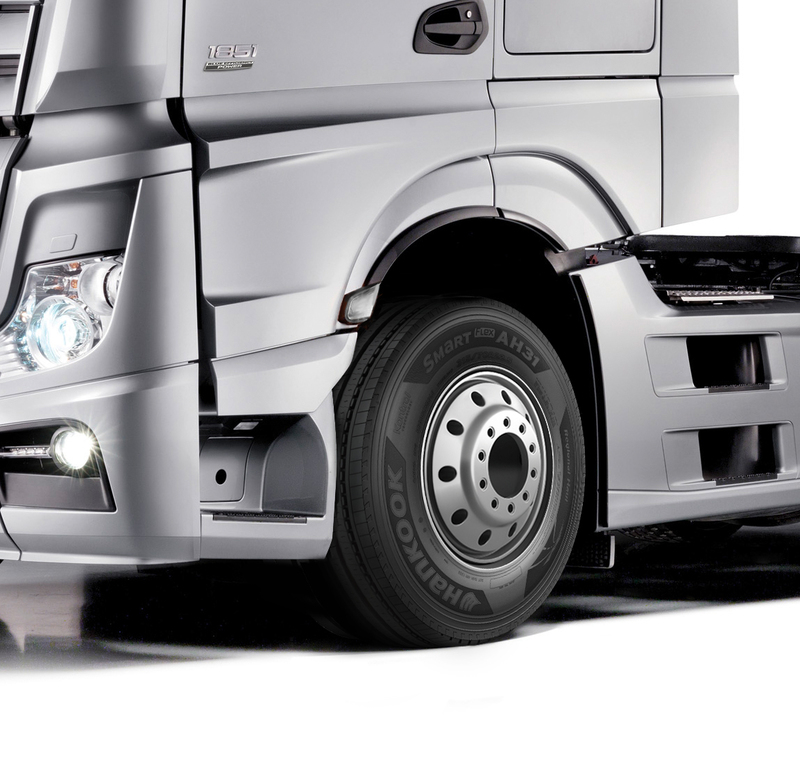 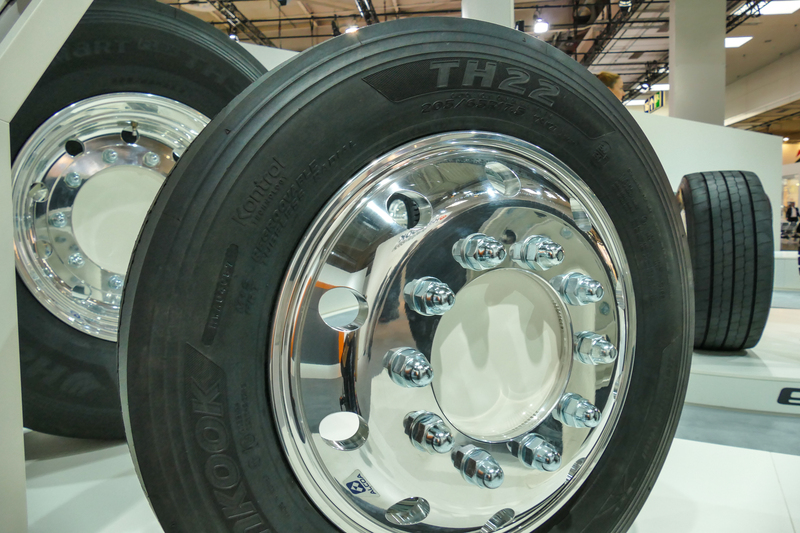 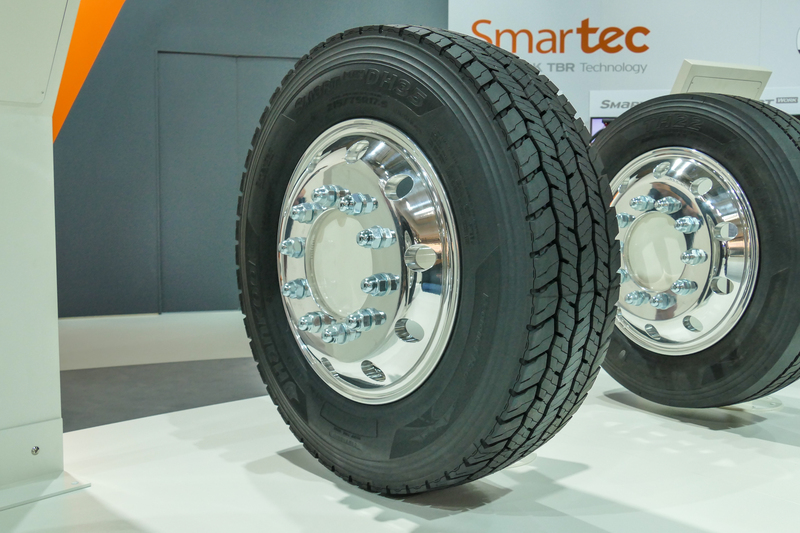 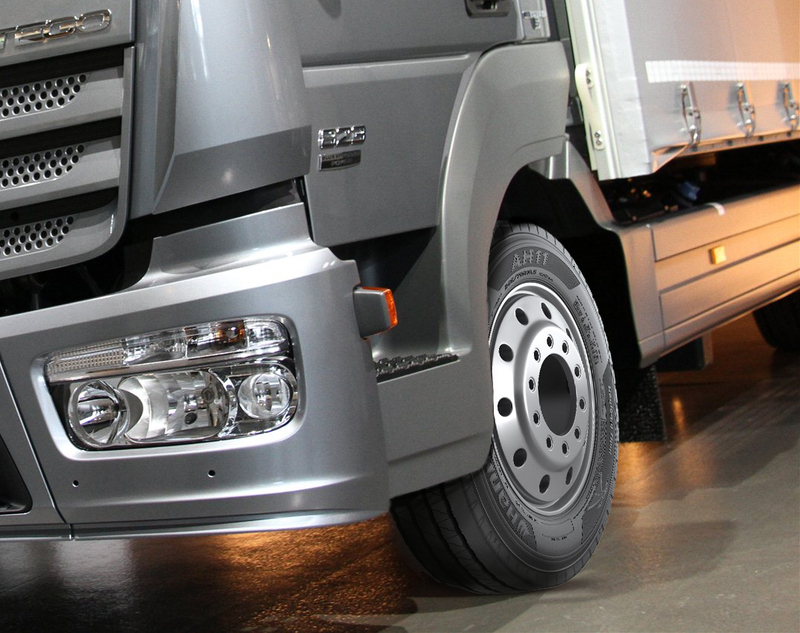 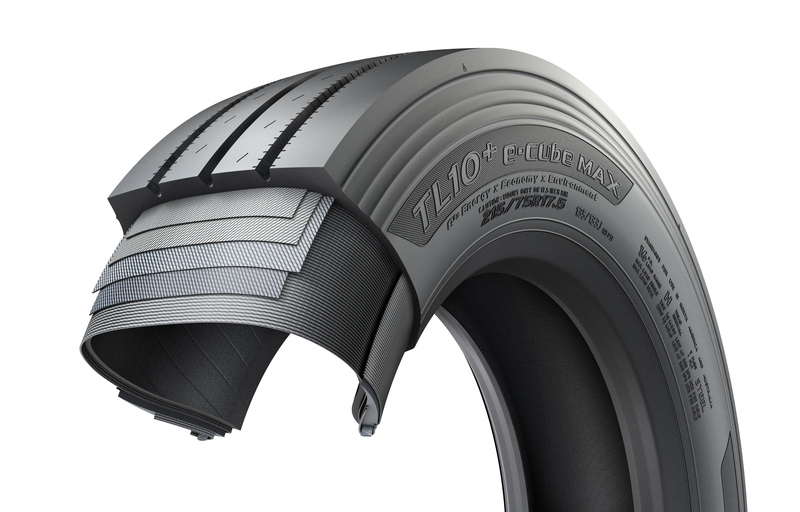 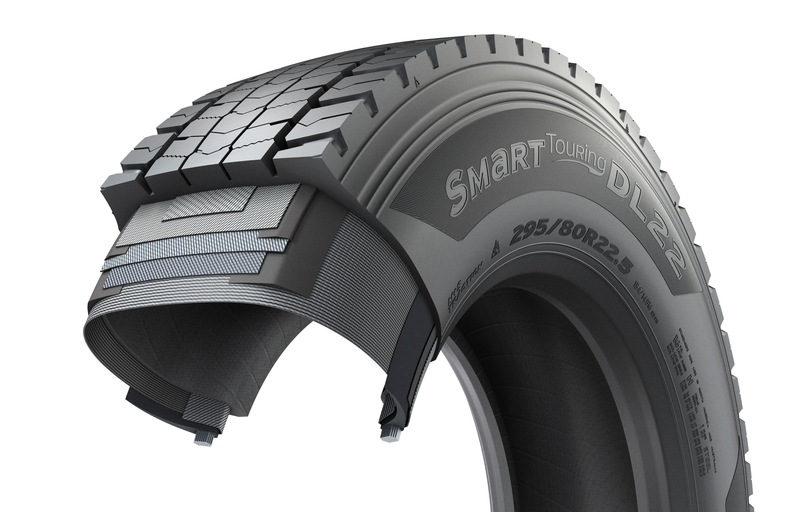 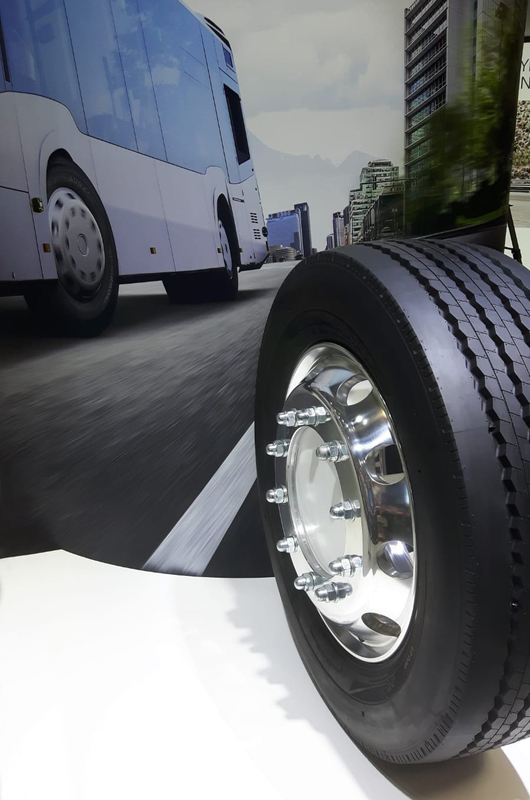 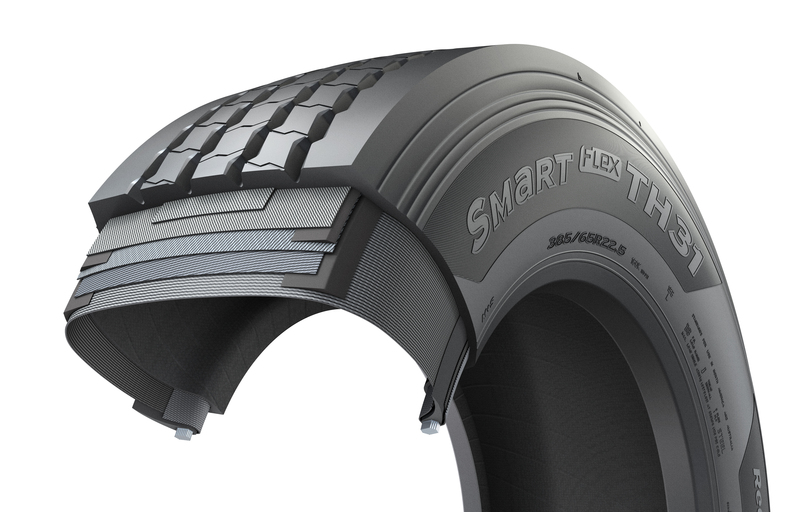 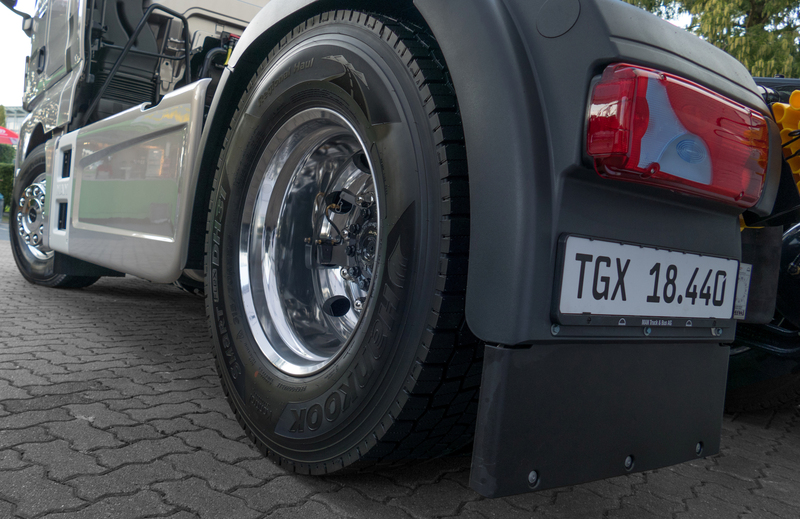 The trailer tyre SmartWork TM15 included in the line has particularly high traction thanks to its high groove width. 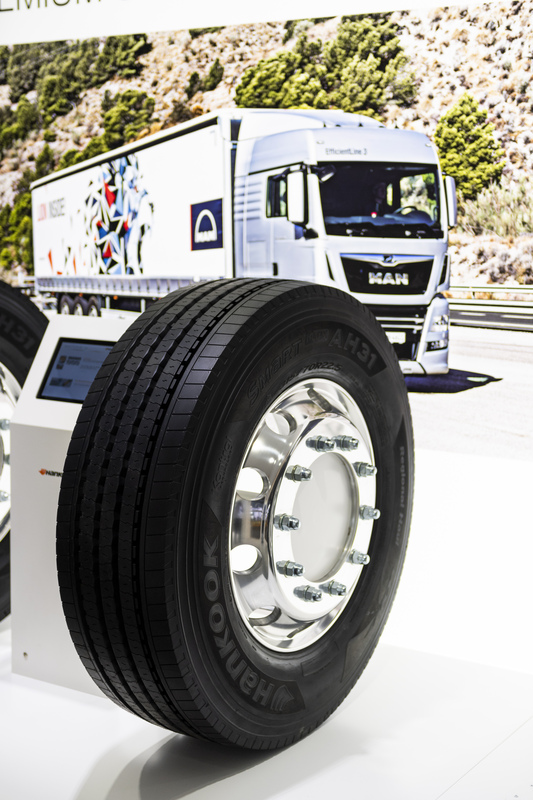 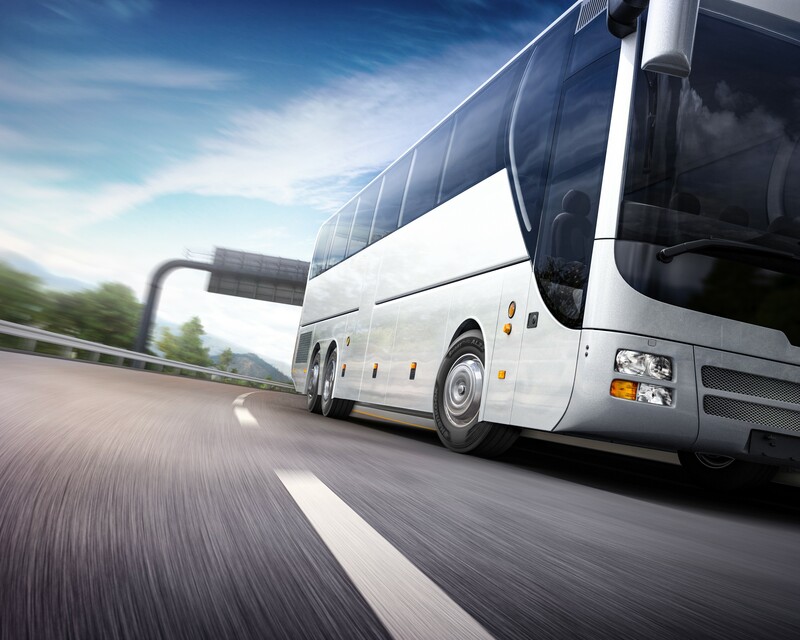 In addition, the trailer tyre stands out on account of very good water repulsion. 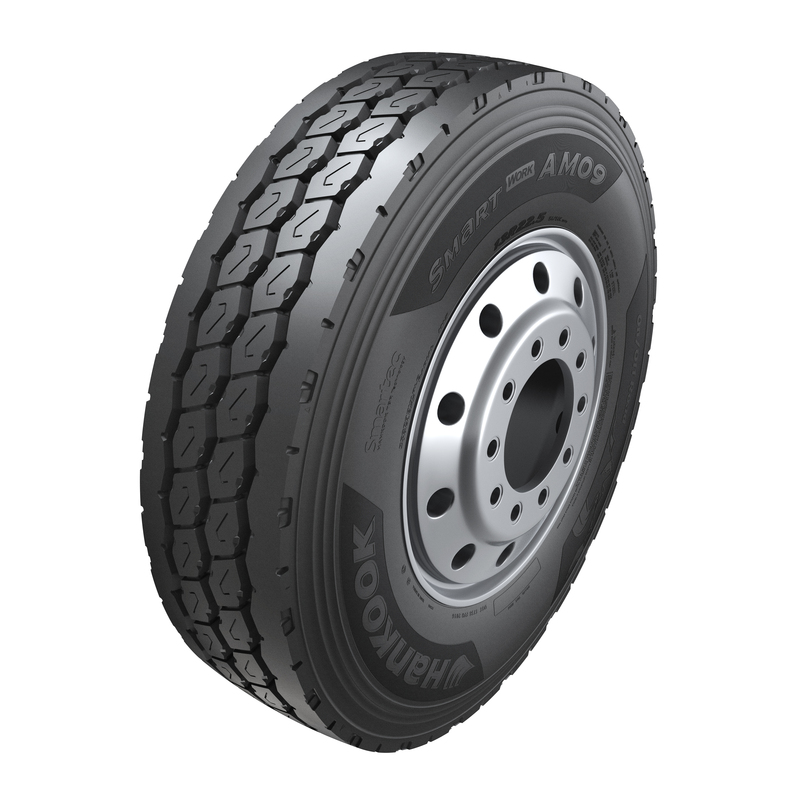 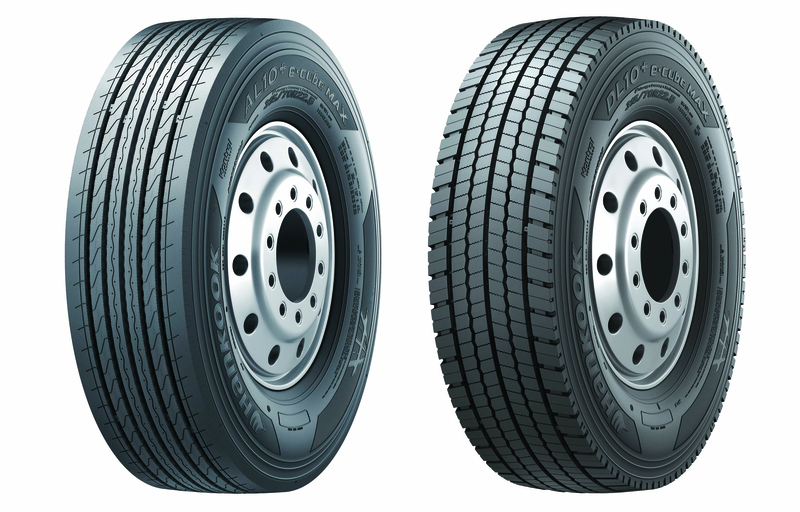 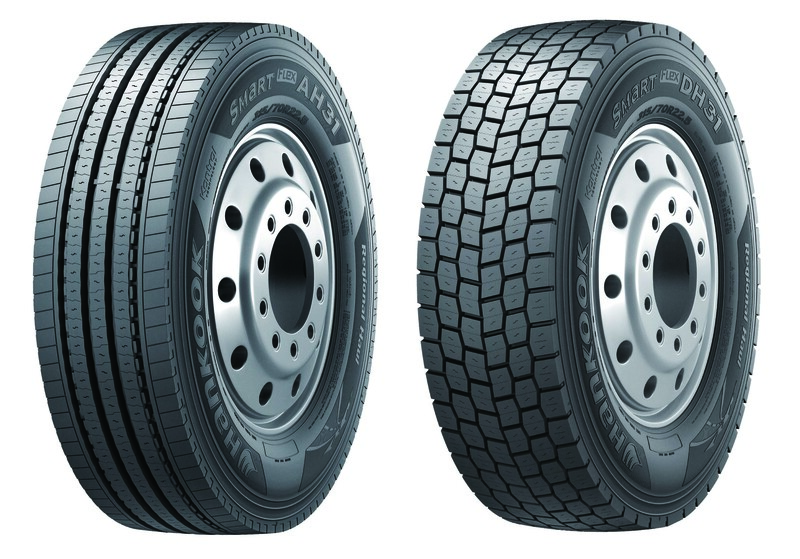 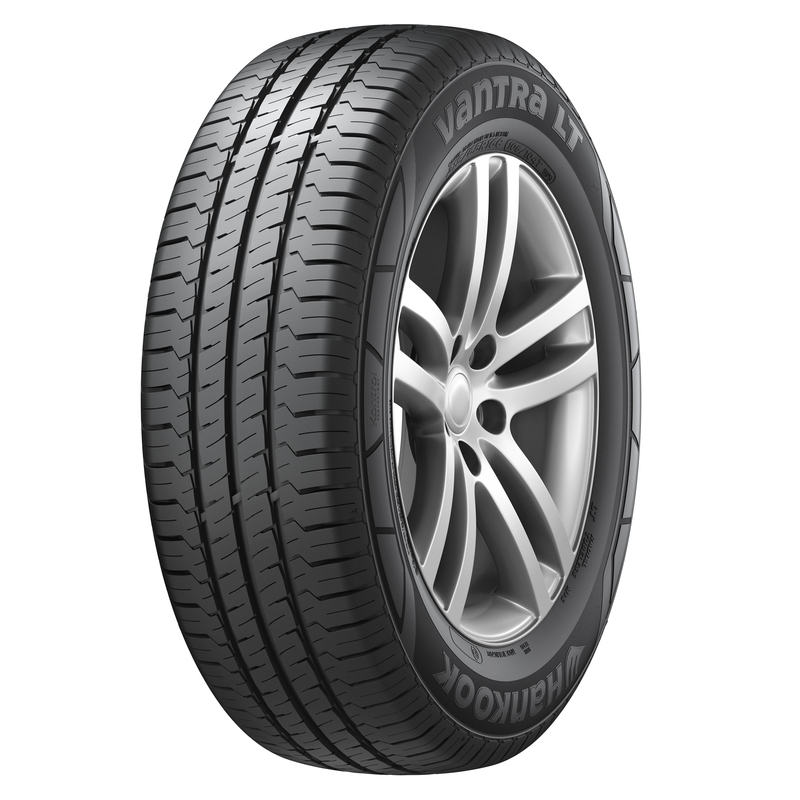 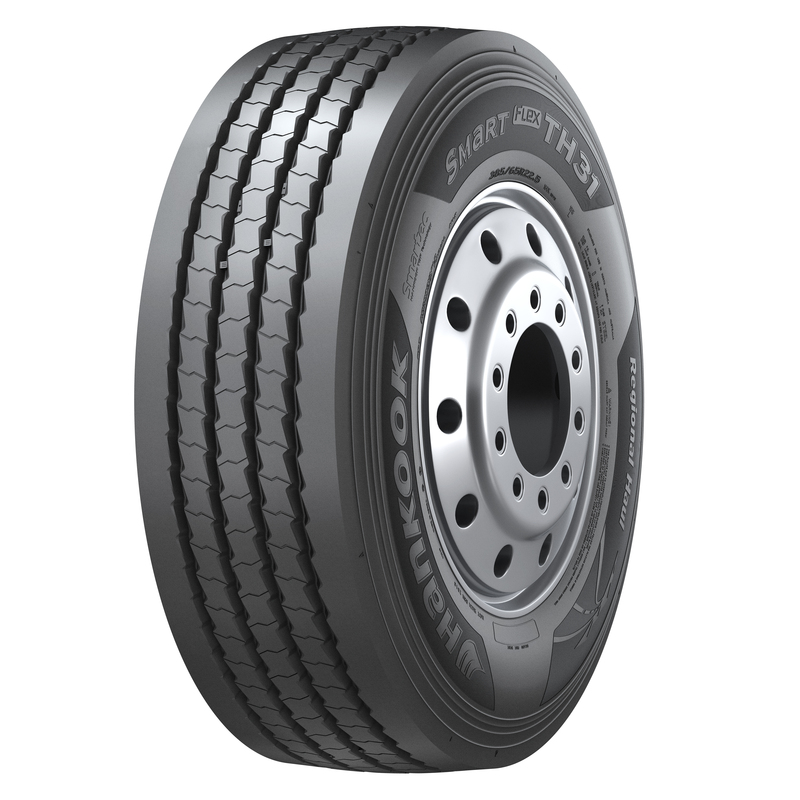 The TH22 is available in standard sizes 235/75R17.5, 245/70R17.5 and 265/70R19.5 and also in smaller sizes especially for use on low-bed trailers.